It can be frustrating when your iPhone appears to be connected to the internet, but data doesn’t flow. Safari won’t load sites, email won’t send, messaging apps won’t work, yet your phone’s Wi-Fi and signal bars indicate a network connection. Network settings control how your iPhone connects to Wi-Fi as well as cellular networks. When you reset network settings on your iPhone, the configurations for all Wi-Fi and cellular networks return to the default settings. A reset also clears virtual private network (VPN) configurations. After a reset, your iPhone should automatically reconnect to your carrier, but you’ll need to manually re-configure Wi-Fi and VPN settings. Before you reset your network settings, first try the following three things when you experience a network connection problem with your iPhone. First, put your phone in Airplane Mode for a minute or two; tap Settings on your iPhone, then move the slider next to Airplane Mode to the right, so you can see green. Wait a minute or so, then move the slider next to Airplane Mode to the left to turn Airplane Mode off. Check to see if your connections now work. If toggling Airplane Mode doesn’t work, turn your iPhone off and back on. Hold down the Power button for a few seconds. Move the slide to power off slider to the right to power off. Wait for your phone to power down, then hold down the power button for a few seconds until the Apple logo appears to turn your phone back on. You’ll likely need to enter your passcode to sign in when your device starts. If you still can’t connect, remove and then reconnect to your Wi-Fi network. Go to Settings > Wi-Fi. The name of the network your device is currently connected to is displayed right below the Wi-Fi setting. Tap the i with the circle around it to the right of the network name. Tap Forget This Network, then tap Forget. This forces your iPhone to disconnect from the network and returns you to the screen that shows available wireless networks. Tap the name of the network you want to join. If prompted, enter the network password, then tap Join. Check to see if your connections now work. 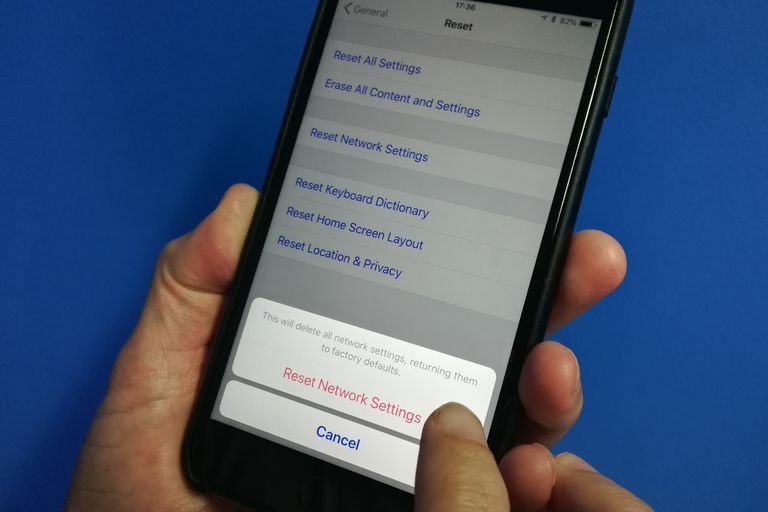 If network connection problems persist, complete the following steps to reset network settings on your iPhone. 1. On your iPhone, open Settings. 4. Tap Reset Network Settings. 5. If prompted, enter your passcode. 6. Tap Reset Network Settings. 7. Your iPhone will reset its network settings, then restart. This may take a minute or two. 8. When you can use your phone again, enter your passcode. 9. Your phone should automatically reconnect to your cellular provider. If your iPhone doesn’t auto-connect to your mobile network, contact your carrier or Apple for support. 10. You’ll also need to rejoin Wi-Fi networks. Tap Settings > Wi-Fi, then tap the name of the network you want to join. If prompted, enter the network password, then tap Join. 11. Check to see if your connections now work. Note: If you use a VPN, obtain and follow instructions from your VPN provider to re-configure their app and/or settings on your device.